Their projects are conceived from creative ideas rather than conceptions of “style”. Inspiration is drawn from traditional and vernacular languages, modernist approaches from the 1940s through the 1970s, shingle style, contemporary open plan, rustic, and many other sources. Each project has a timeless look and feel yet transcends classification in any particular style. The project’s style evolves as they learn what each client aspires to, and is comfortable with. Breese Architects' approach is built on ideas of architecture that transcend a utilitarian result. Peter believes, “It's a creative process that results in this completely unique home or structure you're going to build. The house is not custom unless it's about the land and the client.” The uniquely collaborative studio of Breese Architects consists of architects Peter Breese, Darran Reubens, Nick Waldman, Guntars Lakis and Interior Design Coordinator Amanda Highbloom, and Management and Marketing Director Kathy Pogue. The diversity in age, gender, and background is a strength, offering perspectives and experiences that inform the built result. Breese Architects completes their projects with interior design services. They create unique furniture and customized light fixtures, and many unexpected surprises pop up in their work, like curved ceilings, connectors between rooms that share space with the outdoors and carefully planned windows that capture views like landscape paintings. The two office buildings they designed on Beach Street in Vineyard Haven are a convincing model of what they do. 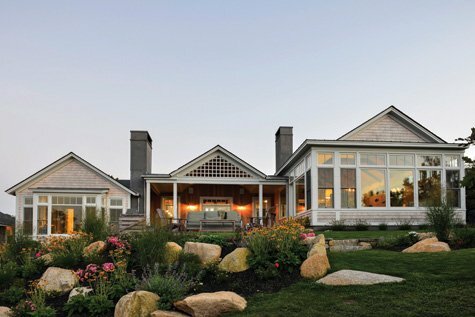 They continue to attract people with their elegant style, large light-capturing windows, subtle massing, and the respect they show for authentic Vineyard architecture. As with all Breese buildings, you want to knock on the door and be invited in. And because this is the Vineyard, you would be most welcome.